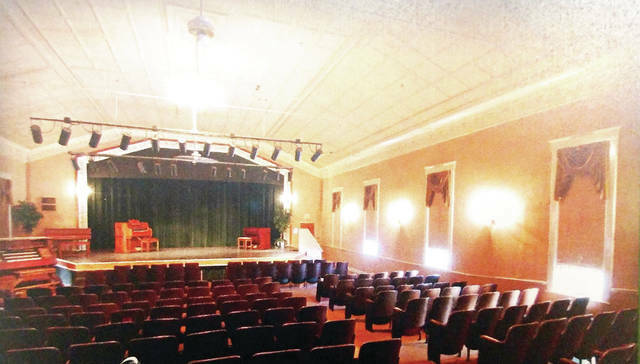 The Fayette Opera House will hold its inaugural “Silent Film/Silent Auction event Nov. 4. Proceeds will cover repair and operational expenses for the 120-year-old building. One of the baskets being auctioned at the “Silent Film/Silent Auction” event. Silence may be key at the Fayette Opera House fundraiser Sunday, Nov. 4, but it will quickly be broken by an afternoon of fun and laughter. The opera house’s inaugural Silent Film/Silent Auction event will begin at 3 p.m., with the hope of raising money necessary for costly repairs to the 120-year-old landmark. Participants will be entertained by a silent film comedy and encouraged through a number system to bid on a plethora of auction items. Proceeds will go toward the necessary removal of an opera house chimney, repairing the wall that held it, and repair of the building’s roof, which hasn’t been updated since the 1980s. The combined cost of the projects is approximately $41,850. The funds raised will also help cover the costs of 14 programs the opera house has scheduled through 2019. The afternoon will begin with the silent auction. Participants are advised to arrive at 2 p.m. to be assigned a number, which they will mark alongside their bids. The auction will include unique items, such as a glass paperweight created by Fayette glassblower Marvin Thorpe; an original oil painting by Fayette artist Joni Beaverson; a wooden bowl and portable wooden chopping block made by Ray Ramsdell, owner of Windfall Woodworks, and hand-painted by his wife, Kathy; a playable guitar inlaid with mosaic pieces; and a tied fleece coverlet with an Ohio State University design. 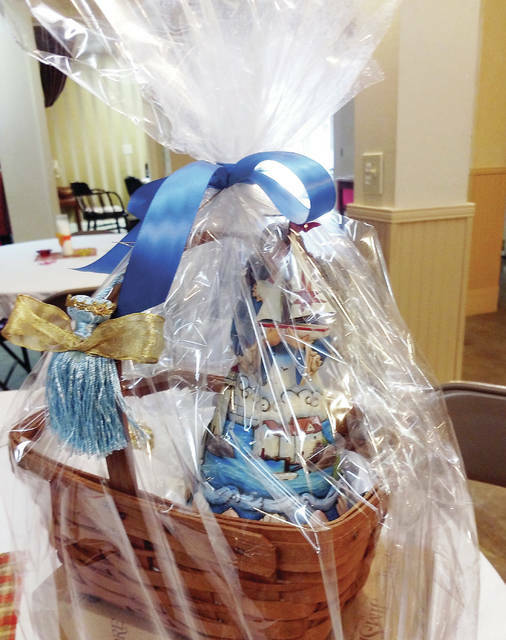 Other auction items include baskets featuring tea and coffee sets, handmade angel figurines, homemade washcloths, and cosmetics and beauty products. There is also a bottle of wine and a holder, and several wildlife prints, among the choices. Some of the more valuable items will have a starting or minimum price. Following the silent auction, the opera house will present “The Freshman,” a 1925 silent film starring Harold Lloyd, a popular, bespectacled actor of the era renown for his physical comedy. The film tells the story of Harold Lamb, an eccentric college student who is mocked by his classmates, and who joins the school’s football team to gain popularity. The movie will be accompanied by the humorously-tinged music selections of Grand Rapids, Ohio, resident Lynne Long, a noted piano and organ performer. Long has lent her playing to the facility’s screenings of other silent films. Ruth Marlatt, a Fayette Opera House board member, and the village’s former mayor, said Long’s piano accompaniment will be a highlight of the event. Snacks will be available after the film, at which time the winning bids will be announced. The cost of the event is $12 per person, $10 for students and senior citizens. Located at 105 E. Main St., the Fayette Opera House was constructed as a town hall in 1898 for $5,830. The first floor was used for government business and postal services. The second floor auditorium was used for programs and graduation ceremonies for Fayette Normal University, as well as community entertainment. The auditorium played host to a 1902 production of “Uncle Tom’s Cabin,” as well as boxing matches, basketball games, dances, and even a radio show in the 1930s. In the 1920s, Variety Magazine reported that the village was home to more actors and stage people than any other place in the country. The aging opera house was eventually abandoned. Led by Tom Spiess, it was purchased by the Fayette Fine Arts Association 40 years ago and revived. Spiess, who served as the opera house’s director since the 1970s, died in March. Dee Lawrence, president of the Fayette Fine Arts Association, said she’d like to see the 180-seat auditorium filled for the film and auction. “We’re very proud of our opera house. We’re hoping that people will come and enjoy this part of the past,” she said. https://www.fcnews.org/wp-content/uploads/sites/45/2018/10/web1_fayette-opera-house.jpgThe Fayette Opera House will hold its inaugural “Silent Film/Silent Auction event Nov. 4. Proceeds will cover repair and operational expenses for the 120-year-old building. https://www.fcnews.org/wp-content/uploads/sites/45/2018/10/web1_auction-basket.jpgOne of the baskets being auctioned at the “Silent Film/Silent Auction” event.